That has been its timeless philosophy from the day the firm opened in 1969, when it concentrated on residential work, to today’s range of projects including some of Tucson’s landmark buildings. The firm’s extensive design experience in a wide range of projects – particularly in education and healthcare – has resulted in its architects being called on to work on projects around the U.S. and internationally. Swaim Associates’ architects are strong believers in going outside the design box to help clients pull the project together and enhance its function. This includes helping them find and analyze a site, studying watershed and flood-plain issues, bringing in specialists, working through political and/or neighborhood concerns, performing feasibility studies, and even leading visioning sessions where clients can reassess how their physical environment can impact their business in positive ways. “Our goal is to expand our clients’ minds about how they live, work, learn and play,” Swaim said. In a community with a major college athletic program, professional sports, plus a youth sports environment involving thousands of kids, athletics has become big business for Swaim. If you’ve been to a UA game, a Tucson Roadrunners hockey game, or had a kid in soccer, basketball, softball, baseball or swimming, the likelihood is high you’ve been at facility designed by the firm. “It started with high school fields and stadiums, and Brandi Fenton Memorial Park,” Swaim said. “At Kino Sports Complex we designed five soccer fields and the soccer stadium. At the same time, we had the opportunity to design the Oro Valley Aquatics Center and Sporting Chance,” a westside indoor sports facility. Also on the list are UA’s William David Sitton Field at the Student Recreation Center across from Arizona Stadium. Swaim has done design work on locker rooms at McKale Center and was involved in improvements to the football stadium in collaboration with Populous, a Kansas City architecture firm. Its latest unveiling was Rita Hillenbrand Memorial Stadium, which was gutted, redesigned and rebuilt in time for the current UA softball season. Swaim has been able to get in on much of the newer industry that has gained momentum over the last several years in the region, expanding its portfolio to hospitality and technology. The firm helped Pima County keep World View Enterprises in Tucson, designing their building near Tucson International Airport, and assisted in luring Caterpillar Surface Mining & Technology Division to a downtown site. They are currently working with Vector on the design of a new rocket manufacturing facility, and with JE Dunn on a new office development at 75 E. Broadway. Swaim was at the starting line for downtown’s resurgence when it partnered with FORSarchitecture+interiors to design one of the signature projects, the AC Hotel Downtown Tucson, the first hotel built in the city center in 50 years. The Marriott Hotel, built by developers Scott Stiteler and Rudy Dabdoub, brought a new element of modernism and urban response with its European style while maintaining a Southwestern flavor. The firm is now designing the new hotel that will go up this year on the Tucson Convention Center property. Part of that commitment includes a focus on sustainable projects. Five Swaim Associates architects are LEED (Leadership in Energy and Environmental Design) accredited. And while not all clients specifically ask for a LEED building, Swaim’s architects generally design all projects with some level of energy efficiency. “It can depend on the priority of the client – some focus on design, some on sustainability,” Barber said. The City of Tucson, Reid Park Zoo and the AC Hotel are clients who are more centered on LEED. Building Information Modeling – or BIM – is becoming more common today with both architects and general contractors. Ryan Companies, the general contractor and developer on the TEP building, required their subcontractors to use BIM, which provided a second level of coordination identifying conflicts prior to construction. “This trend will only continue, and we will continue to help lead the charge into the world of BIM,” Culbert said. 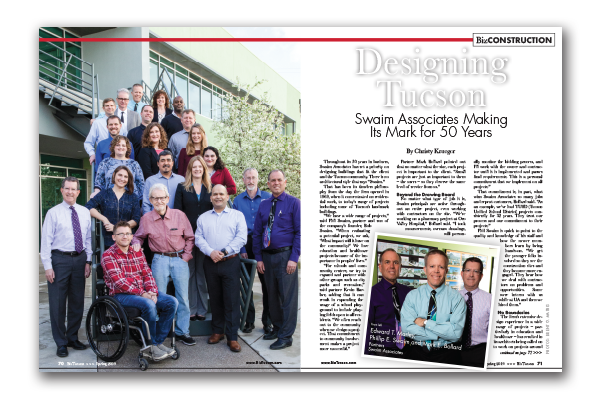 Swaim Associates has evolved through the years by diversifying its project list, keeping up with technology, hiring and training young architects, retaining long-term principals and constantly keeping an eye on the community. “Many firms don’t have the diversity of projects we have, and that’s part of our success, which has allowed us to be stable,” said Phil Swaim.